Would you like to schedule your gallery image to show on a particular date or during a particular time? 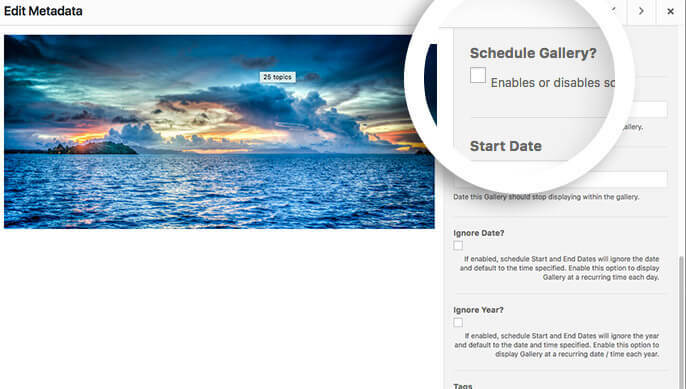 With Envira’s Schedule Addon you can easily schedule individual gallery images. 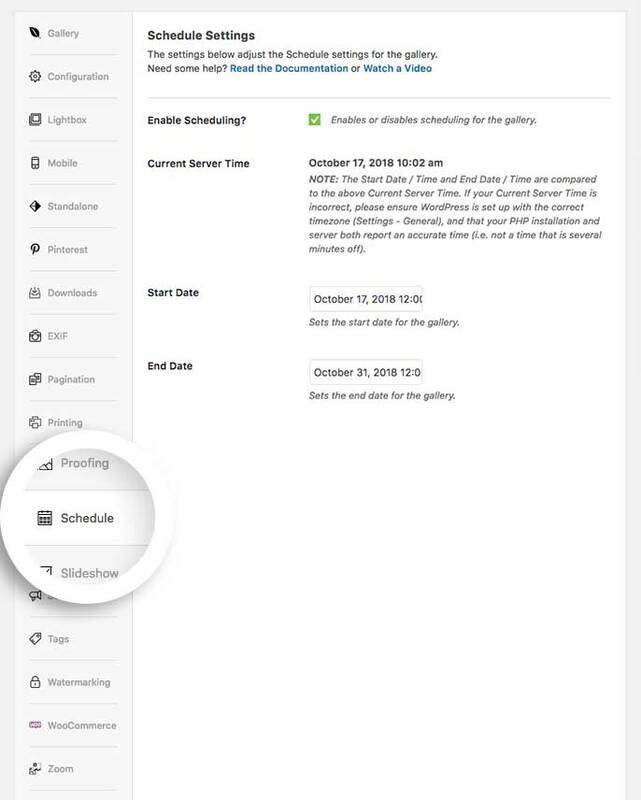 We’ll walk you through how to set up a gallery using the Schedule Addon. Why aren’t my scheduled images displaying? I don’t see a Schedule tab on my albums? Platinum, Ultimate, Agency, Pro or Plus Envira license. You can read how to upgrade to one of these licenses here. In this instance, you’ll be activating the Envira Schedule Addon. Navigate to the Schedule tab. Click the Enable Scheduling? and set up the Start Date and End Date for your gallery. Now we’ll need to edit our gallery images in order to schedule them. To do this, click the blue pencil icon on your images to open the Edit Metadata window. You can schedule each image in the gallery from the Edit Metadata window by setting up the options on the right to schedule each image. 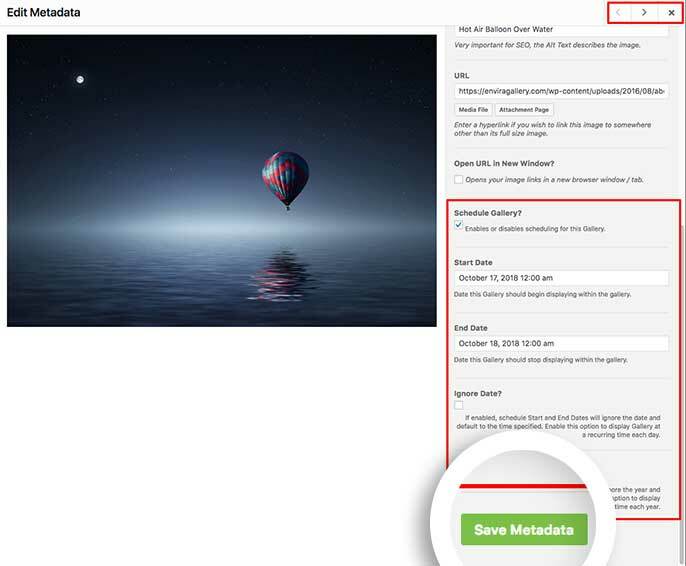 After scheduling each image click the Save Metadata button to save the changes. You can then use the right and left arrows at the top of the Edit Metadata window to go through each gallery image repeating this step until all of the images have been scheduled accordingly. When all images are scheduled, just click the X icon to close the Edit Metadata window. 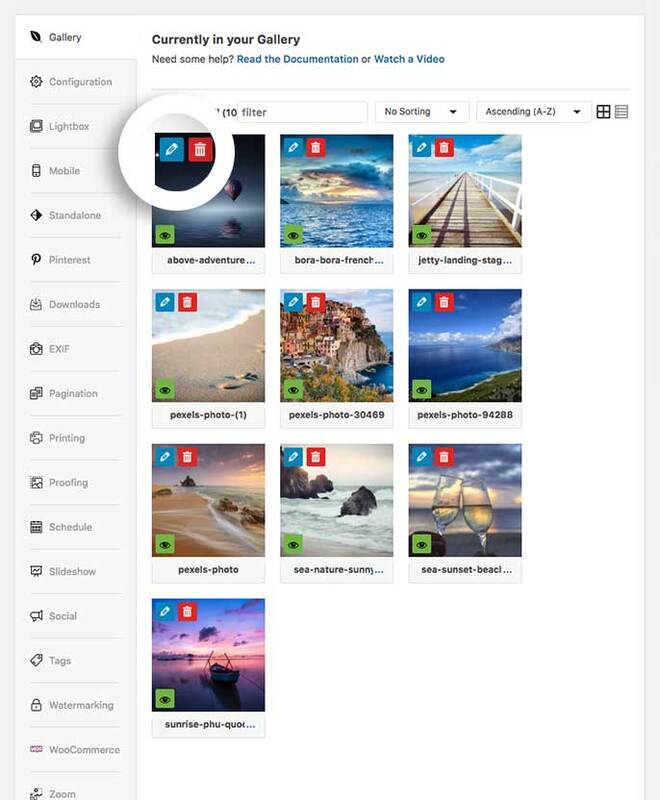 Would you like to have some fun with styling your gallery images further? Check out our tutorial on How to Style Your Gallery Images on Hover. Q: Why aren’t my scheduled images displaying? A: Make sure you’ve clicked the Schedule Image? button on the actual image in Step 4. Q: I don’t see a Schedule tab on my albums? A: The Schedule Addon is currently only available on Envira galleries. Fix: Images showing when not scheduled.